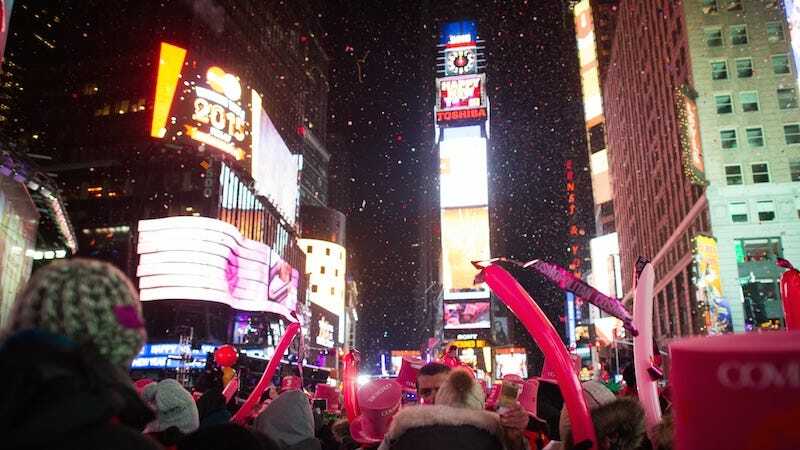 Figuring out where to be when the ball drops is a daunting task, even for the most seasoned New Yorkers. You want to be someplace where you’ll be part of the action, but not harangued by masses of clueless tourists who only want to be able to spot themselves behind Ryan Seacrest on the jumbotron. You want a venue that oozes culture, sophistication, class—three qualities that you’ve also committed yourself to cultivating in 2016. And if that location features a great view of the ball too, you wouldn’t be mad! I get it, girl. I am you. So, in that spirit, I’ve combed through listings, as well as my extensive experience ringing in the New Year in NYC, and put together this list, which should function as a comprehensive guide to the hottest parties the city has to offer. Now, all you have to do is pick. Welcome 2016 like the Europeans probably do—eating a buffet Italian meal just blocks from the center of Times Square. For the price of admission, you’ll also get to enjoy an open bar and DJ, but, sadly, no breadsticks. View of the Ball: “Limited.” Price: $400. This beloved American eatery is offering a NYE bash that screams “classic New York,” probably at you through 20-foot-high speakers. General admission will get you passed hor d’oeuvres (including potato skins, beef empanadas, and Italian hero sandwiches), as well as a DJ and an open bar. If you’re in the mood to splurge, spring for the Couples Champagne VIP package, which will get you a private table for two, a bottle of champagne, and VIP priority admission. View of the Ball: On mounted televisions. Price: $199-$899. This star-studded party will have all your friends saying, “Can’t believe you spent the night with Katy Perry’s corpse!” With over 85,000 square feet of pure party space, this wax museum’s NYE bash is nothing if not spacious. Every kind of ticket holder will get access to the open bar and pasta-based passed apps, while table packages and VIPs will nosh on crudité and cured meet platters. View of the Ball: None, except if you purchase “Inside View of Ball Drop” for $1499, which, in my opinion, is very worth it. Price: $129-$1499. This crustacean-themed fête has actually, unbelievably, sold out. View of the Ball: Limited. Price: Up to $799. My grandfather used to tell me that when he finally debarked at Ellis Island, he put his hand above his eyebrows and squinted, trying to catch his first glimpse of the Times Square Ruby Tuesday. But he was never able to go. This NYE, make my grandfather’s American dream come true; Take advantage of the restaurant’s five-hour open bar, two hours of passed apps, and unparalleled indoor view of the ball drop. Do it for him, for me, for America. View of the Ball: Unparalleled. Also on live stream. Price: $349 and up.